Here is a fascinating entry in a book about the graves in Prague's Jewish cemetery (more below). [Grave entry 3661] 5505 Tammuz (July 1745). Frumetel, wife of Mr. Wolf Fleckeles. She wished to lobby the Sovereign, May Her Glory Increase (! ), at the time of the expulsion [from Prague], on behalf of the sick and newly birthed, to allow them to remain in Prague. The daughter of Mr. Joseph Harfmer. Not that it requires much more explanation, but what it says is that at the time that Empress Maria Theresa decreed the expulsion of the Jews from Prague - late 1744 - Frumetel Fleckeles attempted to petition her to allow the sick Jews, and new mothers, to stay. She herself died in July of 1745 - in Prague, obviously. It is worth pointing out that even in these circumstances the acronym Jews traditionally appended to kings and queens - ירום הודה, יר"ה - is added. Now the simple explanation may just be that of course you were going to add it to a reference to the Queen, even while she was in middle of expelling the entire community. You can curse her in private, but not omit it from a tombstone. Nevertheless, I can't help but feeling that to a certain degree the idea of omitting such an honorific would barely have occurred to Jews, who at the time still had not dreamed of emancipation and equal rights. No, of course they did not want to be expelled - but they also did not really expect to be treated otherwise. They knew that they were given rights of residency not because they were liked, not because they had rights, and not because they were brothers of the people in whose midst they lived. They were mostly allowed to live and prosper where they did because a ruling sovereign permitted it because it was economically advantageous. And usually this was despite the wishes of the masses, who would have preferred if the Jews were not allowed to live there. So, maybe I am wrong, but I suspect that the thought of not referring to an Empress with "May Her Glory Increase" simply because she was being cruel at the moment - and, indeed, in 1748 she allowed the Jews to return to Prague - would not have occurred to them. So just like that, we learn of one woman's heroism by her tombstone inscription. I wish more details were provided, but this is plenty. The above comes from the book Die Familien Prags. 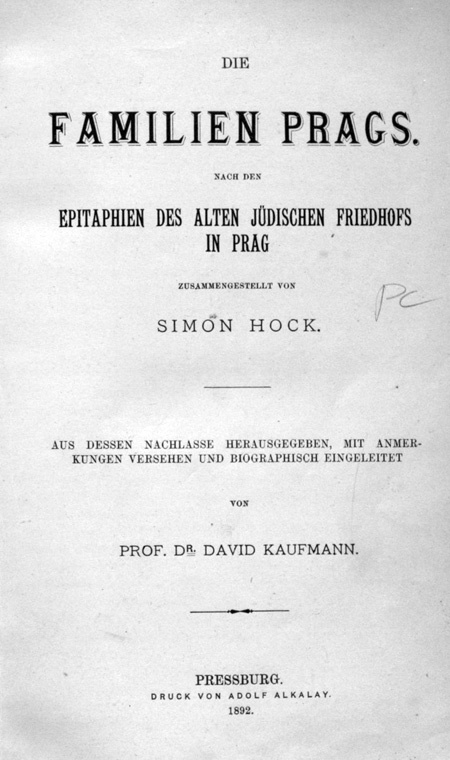 This book was published by David Kaufmann, based on the research of Simon (Sinai) Hock, a prominent Prague communal leader, who was an amateur historian (hmm). With notebook in hand Hock copied thousands of gravestones in the Prague cemetery, and after he passed away, Kaufmann published them. Basing himself in part on Hock's gruntwork/research, Kaufmann published an article called Der Stammbaum des R. Eleasar Fleckeles, and he refers to Frimet Fleckeles' actions. He adds nothing new, so I assume he got it off her tombstone inscription as copied by Hock. Here is a post I once did about the reaction of English Jews (and eventually the British government) to Maria Theres's expulsion order, and how they tried to persuade her to rescind it (link). What does רצתה בהשתדלות mean? You translated it as "She wished to lobby", but what does that mean? Did she attempt to do so? If not, why not? Did she actually do so? If not, what prevented her? If so was she successful? I don't understand how a mere desire to lobby someone would be an achievement that would be recorded on a tombstone. I'm tempted to speculate that רצתה is an incorrect transcription, and that she actually achieved such a result, which would indeed be something for her family to be proud of. I have no idea. I assume she did lobby and lobbied successfully, the info is simply lacking so I didn't want to create stories based on words that don't say more than that. You are probably right, she was successful. I didn't really delve into the whole sequence of the expulsion, but since the order was in December of 1744 and she died in Prague in Tammuz 1745, I'm tempted to say that she did indeed succeed; after all, why was she still there? Perhaps she even personally played a role in ministering to these sick people. I don't know, but my guess is that the Prague kehilla had a Jewish hospital. Note that she was from one of Prague's most prominent families (and according to Kaufmann, her father was a doctor in Vienna) - she wasn't merely some nice lady who wanted to accomplish something - they probably had connections in the royal court. IMHO רצתה here means "found favor" or "persuaded favorably" or "was accepted" -- ala the end of Megilas Ester that we just read re Mordechai that he was "RATZUI l'rov echav" וְרָצוּי לְרֹב אֶחָיו . So, yes, it seems that she did succeed in her shtadlanus - & therefore was still in Prague when she passed away the next year (1745). Abs0utely. You are of course correct. Thank you! Actually, having slept on it, me thinks that a more accurate definition would be "persuaded favorably leading to reconciliation" -- ala the Mishnah in Yuma (ח, ט) that "עברות שבין אדם למקום יום הכיפורים מכפר. עברות שבין אדם לחברו אין יום הכיפורים מכפר, עד שירצה את חברו" (v. Rif on Ein Yaakov ibid. that וכיון שהוא מרצה אותו ומפייסו אז הקב''ה מתרצה לו לכפר לו עוונותיו שחטא בינו לבין המקום . & from the Bavli ibid. 87a it seems that the Gemoroh assumes that מרצה is related to פיוס. 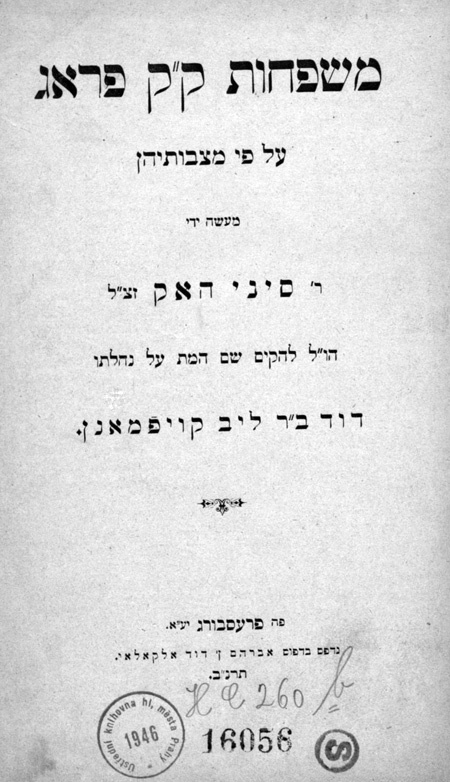 Note that Soncino translates שירצה as "pacified"). In this context, ...רצתה בהשתדלות can mean not only that "she lobbied by the Sovereigness," but perhaps also that "she lobbied successfully [lit., favorably/persuasively] by the Sovereigness." Maybe I missed it, but what was her relation to the Teshuva MeAhava? Grandmother? Actually, yes, she was. 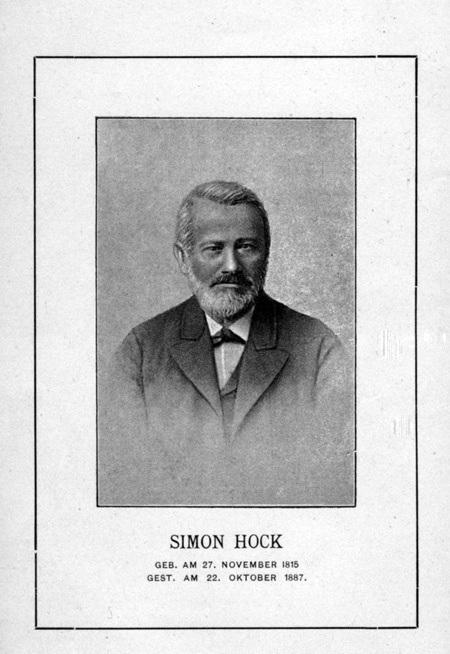 Simon Hock (or Kaufmann) footnoted here "אולי הוא זקנו של הגאון ר' אלעזר פלעקלש," but later Kaufmann published an article in which he publishes a complete Fleckeles family account, written by R. Elazar himself, which he acquired. You can read it here, and R. Elazar says she was his grandmother. My partner and I absolutely love your blog and find nearly all of your post's to be exactly I'm looking for. I wouldn't mind writing a post or elaborating on a number of the subjects you write with regards to here. Again, awesome web log! 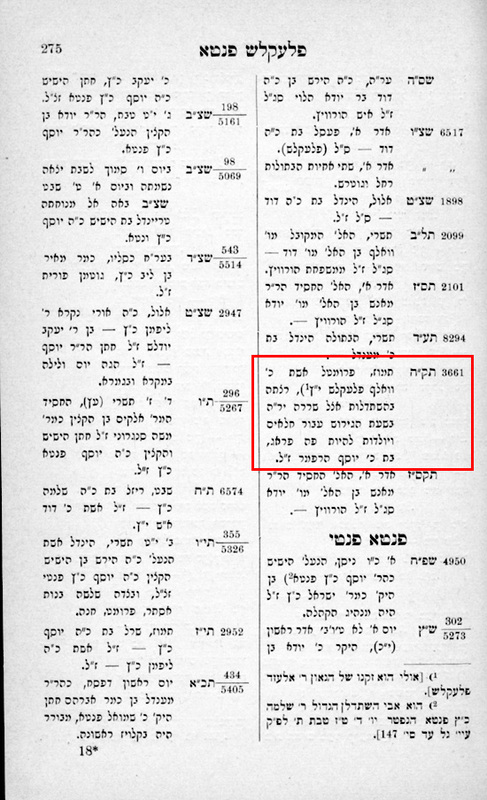 A cholent/kugel ode from 1889.